You probably remember being on that Admissions Office tour way back when, lead by the effervescent tour guide who boasted, “...and to our right is Canaday, the newest dorm in Harvard Yard, completed in 1974. The architect, Ezra Ehrenkranz, built this dormitory in the shape of a question mark. 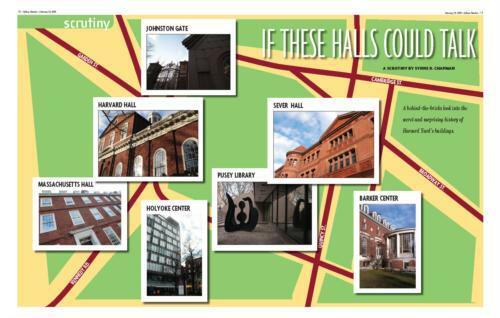 And right ahead is our Science Center, which I’ve been told, looks like a Polaroid camera from an aerial view.” While these architectural tidbits certainly add some flair to the Yard, they are not the only Harvard buildings with an interesting history. Built in 1718, Massachusetts Hall is the oldest building still standing at Harvard and the second oldest academic building in the country. Like most of the Harvard buildings that existed during the Revolutionary War, the Continental Army used Mass. Hall to house soldiers. Apparently, soldiers and freshman share a penchant for slobbery. Legend has it that while housed in Mass. Hall, soldiers set back the University nearly 50 pounds in damages. Considering that the whole building cost 3,500 pounds to design and build, the soldiers must have had a pretty serious party. Today’s Harvard Hall is actually the third Harvard Hall to exist on campus. The original Harvard Hall, completed in 1644, was the first building that Harvard ever commissioned for construction. After thirty years, the building began to rot and was deemed uninhabitable, but the University waited until 1686 to demolish it. While the second Harvard Hall fared slightly better, it was destroyed by a fire in 1764, along with John Harvard’s library collection. That same year, the third and current Harvard Hall was designed by Francis Bernard, the governor of the Massachusetts Bay Colony, and students have been sleeping through lectures there ever since. Sever Hall, constructed in 1880, and designed by Henry Hobson Richardson, is a favorite of architectural critics. “Sever is considered by architects and historians to be one of the great American buildings,” said Eve Blau, Professor of Architectural History and Director of the Master of Architecture Degree Programs at the Graduate School of Design. Although his namesake is revered, John Warren Sever was not a model student. His student records show that his class attendance was so poor that he was forced to make up his classes privately, and was fined for “improper behavior” during services. Johnston Gate was built in 1890 and is currently the oldest gate in Harvard Yard, designed by the New York firm McKim, Mead & White. The gate was the first Harvard structure built from what is now referred to as “Harvard brick,” used to ensure that the gate would resemble already extant eighteenth-century buildings in the Yard. The University requested that the gate, along with future buildings, only use a distinct type of hand-made and wood-burned red brick. The Guardhouse, also referred to as the “Gatelodge,” was constructed in 1983 and designed by Graham D. Gund. Gund graduated from Harvard’s Graduate School of Design with two degrees, in 1968 and 1969, respectively. His father, the late George Gund ’09, a graduate of the college and Harvard Business School, is the namesake of George Gund Hall, which now houses the Graduate School of Design. The building, approximately the size of a portable toilet, cost the University $57,000 to construct, with and additonal $10,000 that was spent on necessary restorations to the surrounding area. It is easy for frequent visitors, and even residents, of the Old Yard to miss the the small chapel nestled behind Hollis Hall and Stoughton Hall. Holden Chapel, tucked between these two dorms and the Phillips Brooks House, was built in 1744. The chapel is the third oldest building in today’s Yard. While Holden Chapel is no longer used for religious purposes, it is the rehearsal space for the Holden Choirs, which consist of the Harvard Glee Club, the Radcliffe Choral Society, and the Harvard-Radcliffe Collegium Musicum. Despite the University’s ecclesiastical namesake, there was no chapel on campus for the first century of Harvard’s existence. The wife of Samuel Holden, a wealthy Englishman and avid supporter of Christian causes, donated 400 pounds to the University construction of the chapel after her husband’s death in 1740 for the. Despite its slated purpose, Holden Chapel was only used as a chapel for 22 years. In 1766, Harvard Hall became the new house of worship on campus. Holden Chapel has since functioned as a firehouse, laboratory, museum, auditorium, classroom, and even the Medical School, not to mention barracks for the Continental Army during the Revolutionary War. The Phillips Brooks House, built in 1898, was designed by Alexander Wadsworth (A.W.) Longfellow, Jr., an 1876 graduate of the college and nephew of the famous poet, Henry Wadsworth Longfellow. A.W. Longfellow also designed Cambridge’s City Hall. Before the construction of the Phillips Brooks House, undergraduates at Harvard were required to attend daily church services. The mandatory services generated backlash from students, and the University responded by designating the Phillips Brooks House a space for voluntary services as well as the newly-created department of Religion. The building was also used for charitable and social religious programs, which has carried over to its contemporary purpose, as the space for a secular umbrella community service organization. Even the VES students who—often literally—call the Carpenter Center home might not realize the significance of the building itself. In fact, many students consider the building a campus eyesore. “I don’t think that it’s a building that people should necessarily like just from looking at it,” says Hyde. “I think that it’s a building that you actually have to experience and spend some time in it before you should be expected to make a decision about whether or not you like it.” The Carpenter Center is the only building designed by Swiss-French architect Charles-Edouard Jeanneret-Gris, known as Le Corbusier, in North America. Rumor has it that Corbusier came to see the building when it was completed in 1963, only to accuse the contractor of building it upside down. Others insist that Corbusier never even saw the Carpenter Center in person. The lore surrounding Widener is familiar to many: namely, the bibliophile Titanic victim whose mother donated a boatload—pun intended—of money to the school, premised on the condition that Harvard instituted a swim test as a requirement for graduation. This rumor is partly true. Harry Elkins Widener ’07, along with his father, died on the Titanic. His mother donated a large sum of money to the school in his name for a library, but stipulated that once Widener Library was built, its facade could not be altered. As a result, a walkway built between Widener and Houghton was made to go through one of Widener’s original windows. The odd crossing was eventually torn down for safety reasons. Pusey library is named after Nathan M. Pusey, the 24th President of the University and a graduate of the class of 1920. Students may giggle when we say its name out loud, and any who visit know it is underground, but Pusey’s secret is that it is an architectural feat. Upon completion in 1970, Pusey was one of America’s few underground libraries. In order to build the library underground, anchored in the surrounding bedrock, the building had to be attached to the bedrock with a series of steel beams. Without these beams, the library would literally rise up from its underground location. Completed in 1997, the Barker Center exists on the lot of land that formerly held several notable buildings: the Student Union, Burr Hall, and Warren House. Until the 1990s, freshman ate in the Student Union. When the University decided to combine the three buildings to form the Barker Center, they first refurbished Memorial Hall in order to transform it into the freshman dining hall that it is today. The Barker Center, designed by the Boston firm Goody, Clancy & Associates, cost upwards of 25 million dollars to complete. Memorial Hall, completed in 1878, was meant to serve as a memorial to Harvard alumni who had died on the Union side of the Civil War. Mem Hall, as it is often called, was designed by Henry Van Brunt, class of 1854, and William Robert Ware, class of 1852. The two architects were chosen to design the building after winning an architectural contest sponsored by the University. The Building, which resembles a basilican church, was designed in the shape of a cross. “Three Centuries of Harvard (1636-1936)”.